John Travolta says he's not going to give up playing bad guys until he gets to be a villain in a James Bond film. I dig John Travolta's work. Yes, he may threaten to veer into self-parody now and then, but overall the man is a solid talent, particularly when it comes to playing psychos, lunatics and plain old bad dudes. As it turns out, he digs that kind of character and doesn't plan on giving up on them until he's joined the ranks of the baddest of the bad: Bond villains. He currently has two "tough guy" roles coming up, one of which will see him play mobster John Gotti Sr. in a 2015 biopic, but what he's really aiming for is to be cast in a James Bond movie. "I would love that," he said in an interview with The Telegraph. "They're going a different way with their villain in this next film but I've spoken to Barbara Broccoli about it and she loves the idea, so that would be great." And despite turning 60 very soon, he said he won't "close the chapter on playing villains" until he gets the role he covets. Barbara Broccoli, as even a casual fan can tell you, is the daughter of famed Bond film producer Albert R. Broccoli and producer herself of the more recent Bond flicks starring Pierce Brosnan and Daniel Craig, so if Travolta has spoken to her, it's fair to say he's serious about the idea. Could he pull it off? Travolta's characters tend to have rather outsized personalities, so while he may have been a good fit for some of the earlier (and sillier) Bond movies - I'm thinking of a Max Zorin type of guy - I'm not sure he could effectively tone it down enough to pull off something like Le Chiffre or Renard. 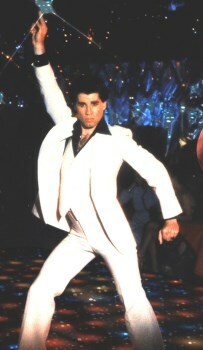 But perhaps his advancing years would give Travolta a certain gravitas his previous roles have lacked. I don't know if it would work, but it might be fun to watch him try.